Life In A House of Blue ! : PopChips Announces 2 New Popstars ! Home > press > PopChips Announces 2 New Popstars ! PopChips Announces 2 New Popstars ! Many of my readers may remember the review I did on Popchips HERE and how my whole family thought they were YUMMY ! Popchips has done it again ........ 2 New Flavors ! Sour Cream & Onion & Cheddar !! Popchips sent my family a sample of the new flavors today and just as I suspected, they were GREAT ! "popchips™ are an all-natural line of popped chips with all the flavor and less than half the fat of fried chips. popchips, inc. was formed in 2007 to bring new flavor and real innovation to the snack aisle. Thanks to the magic of popping, popchips offers a snack so tasty and crispy that you won’t even notice it’s healthier. " Like all Popchips, these new flavors are all natural and have less than half the fat of fried chips. A 1 ounce serving size of each contains 120 calories, 4 grams of fat, 0.5 grams of saturated fat, 0 grams of trans fat, 0 milligrams of cholesterol, 290 milligrams of sodium and 20 grams of carbohydrates. 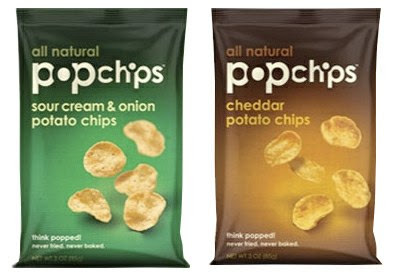 For more information about the company and its products, pop over to popchips.com. Sour Cream and Onion sounds totally delish!